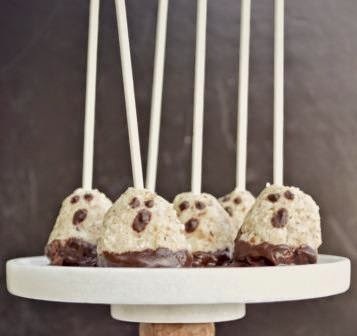 Cara created these adorable chocolate-covered macaroon ghost pops back in 2012, and I thought they were absolutely perfect to feature on the countdown, seeing as they fit right in with the ghostly theme! If you follow Cara's recipe and use her raw chocolate these will be raw, or you can just use melted chocolate chips so they will be mostly raw. 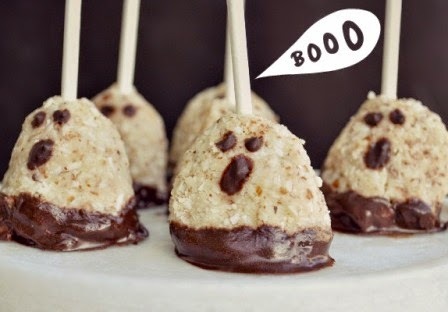 These little ghouls look almost too good to eat, but you'll want to scarf up the whole lot after you take a bite! They seem like the perfect decadent treat, but the coconut and dates make them pretty healthy! How's that for a trick and a treat?! You can find the recipe for these ghosties on the Fork and Beans site! And I highly recommend picking up Cara's cookbook, titled Decadent Gluten-Free Vegan Baking!